DPI and reports per second are not published. Full size, battery powered cordless mouse. This is what I used myself, the lime green model. It comes in black, pink, teal, berry and lime green. I don’t recommend it. 3 Buttons. It did not work on a black mouse pad even though they advertised advanced BlueTrack technology that should run anywhere. I had to use it on the wood grain desk top. 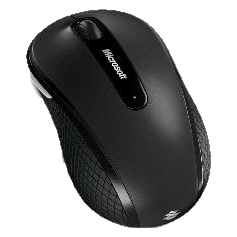 The mouse wheel does not click as it moves. It is advertised to have both laser and LED. I see no sign of anything but a blue LED. It is quite a bit jerkier than the old Logitech. The transceiver is tiny. It plugs into any free USB port. I found trying different ports would improve jerkiness. I found it worked best plugged into a USB extender cord (left over from the old Logitech mouse) so that the receiver sits about 20 cm (7.87 in) from the mouse. There is a traveling storage slot for the transceiver housed in the mouse, which might be confusing to someone who does not understand the physics. It does not have feet, rather two large semicircular arcs. I trust that will provide extra wear. It advertises extremely long battery life, but I get only 3 weeks, much worse than my previous Logitech. The mouse has a Mickey Mouse exposed spring near the light sensor. I don’t know what its function is other than to interfere with cleaning. It died after a few months with the cursor too jerky to use and the mousewheel frozen. This a dog, but a handsome dog.